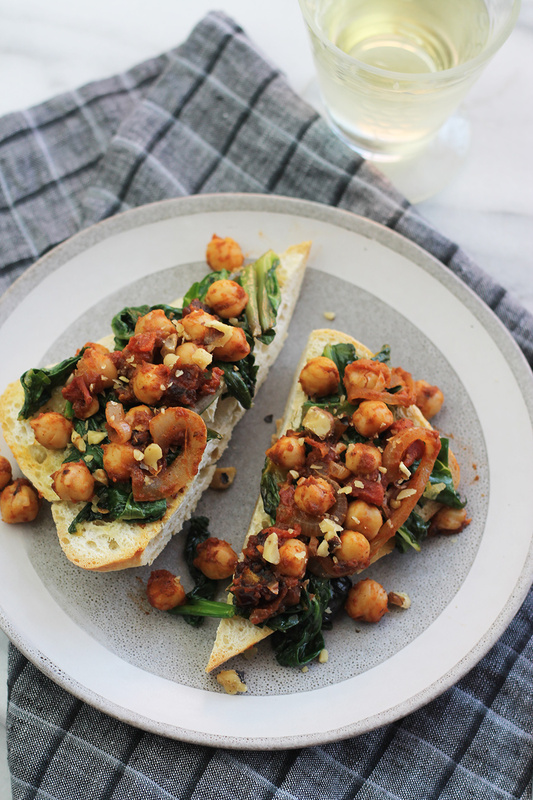 This Moroccan Inspired Chickpea Tartine with Spinach and Chard is a simple easy and delicious meal. 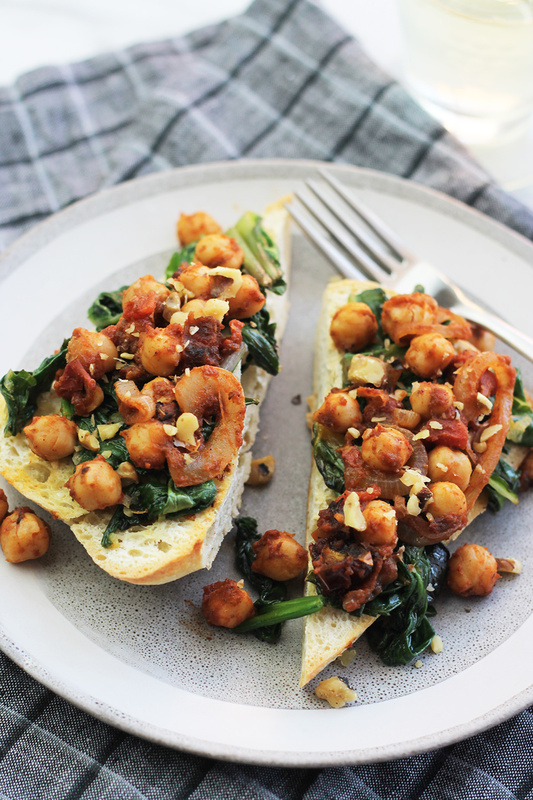 Crisp garlic toast topped with sautéed greens and chickpeas seasoned with a Moroccan inspired spice blend. If you were to look through my pantry you are sure to find several cans of chickpeas or dried chickpeas. They come in handy when I’m in need of a quick meal or snack. When I’m in the mood for a slow cooked meal, I prepare dried chickpeas in my instant pot to use in soups or stews. 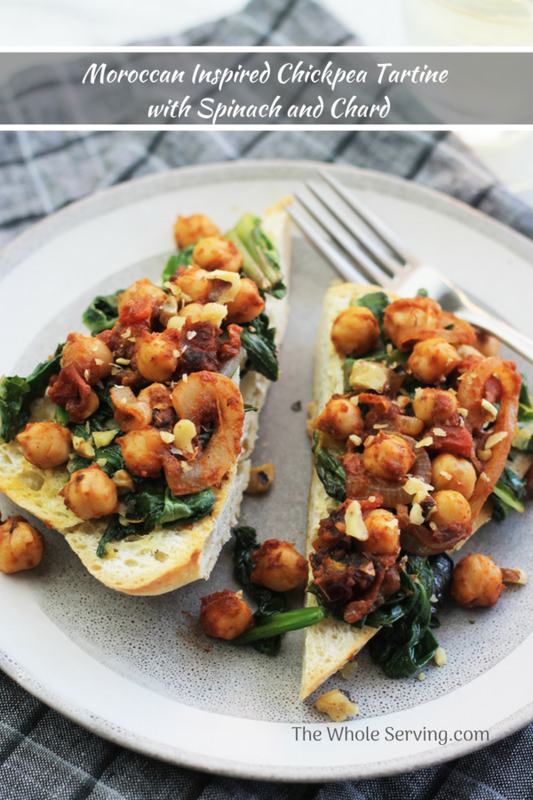 It’s amazing how many ways chickpeas can be used to create delicious and relatively healthy meals. They’re a good source of protein and fiber. 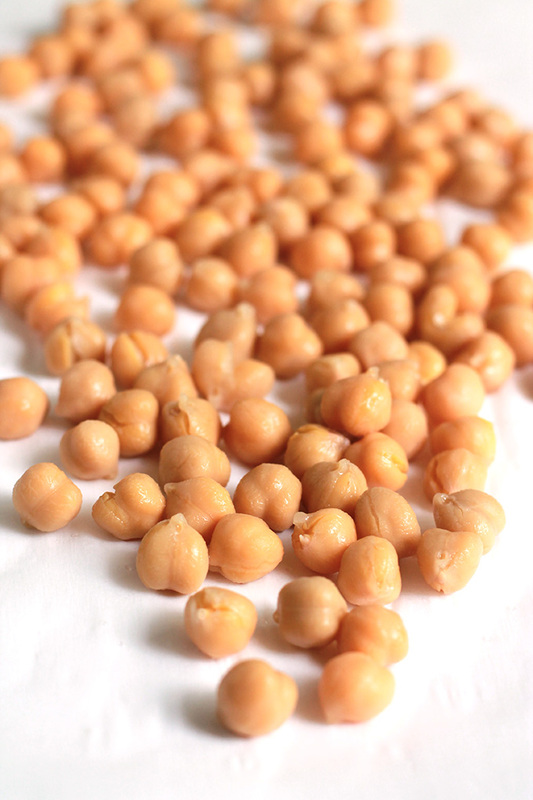 Lately, we’ve been roasting chickpeas to have on hand for a quick snack or to throw on a salad for some added protein. 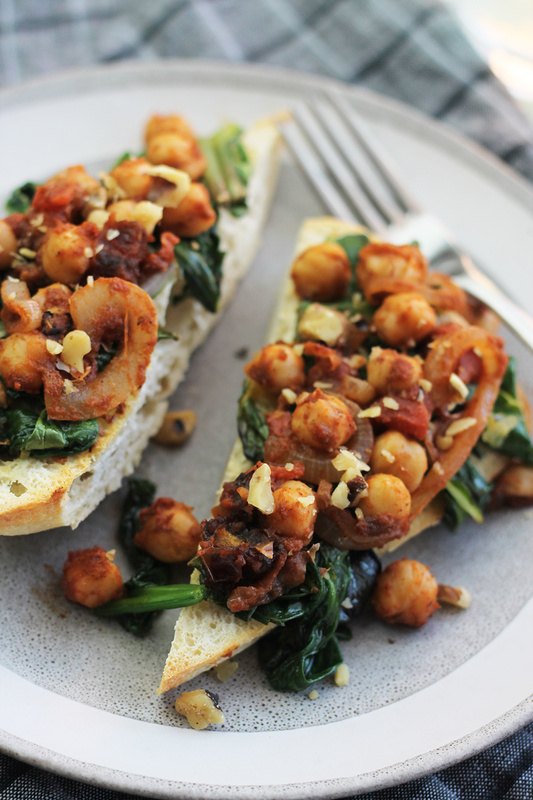 This recipe uses chickpeas as a tartine topper. French in origin and pronounced tärˈtēn. A slice of bread with sweet or savory spreadable toppings, such as jams, honey, creams and sauces. Basically a fancy name for open-faced sandwich. This recipe is a variation of a true Tartine because the toppings aren’t super spreadable. However, if you want you can blend the chickpea topping into a spread. I kept it unblended for a heartier taste. This recipe comes together fast! 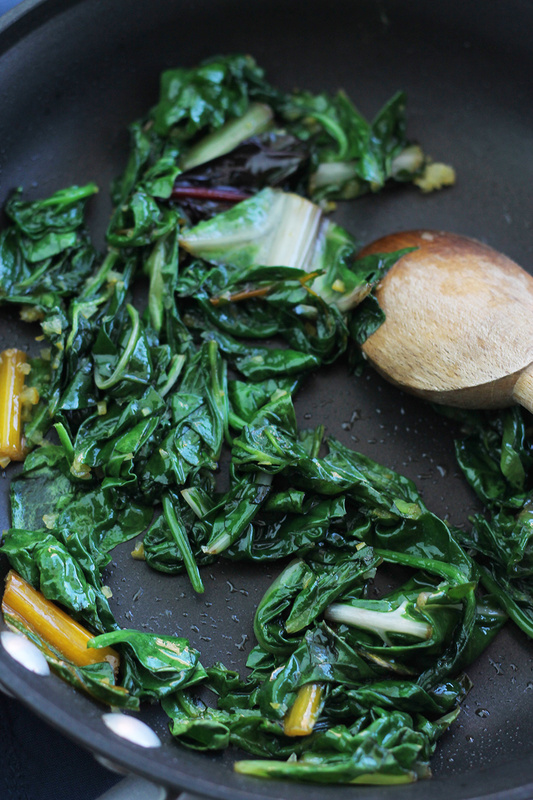 The greens are sauteed and set aside and kept warm. The same pan is used to prepare the chickpeas, makes for an easy clean-up. I always have chickpeas in the house. They are so delicious and nutritious, and a great sub for meat. This looks awesome, and I know hubby wound like it too, Love the spices in this recipe. What an excellent way to get some nutritious protein and fiber. The spices really jazz up the tartine and I imagine this would make a great lunch/snack/or in smaller portions appetizer. We do have chickpeas in the pantry — I think I’ll make the tartine this weekend. wow I love how you spiced this one up and chickpeas are an every day must on my salads this will be a special treat! I am always ready with chickpeas in my house. I have dried in the pantry as well as boiled frozen in the freezer. There is so much you can do with these protein-packed little goodies. Love the sound of this recipe and can’t wait to try it soon. I’ve never had tartine before … but I am a fan of open faced sandwiches! Love the way this looks – so colorful with those ingredients! Will be trying this one out. This looks absolutely delicious! I love Moroccan food and all of the fresh veggies on top make it all that much more delicious. I’ll definitely be adding this one to our meal plan. 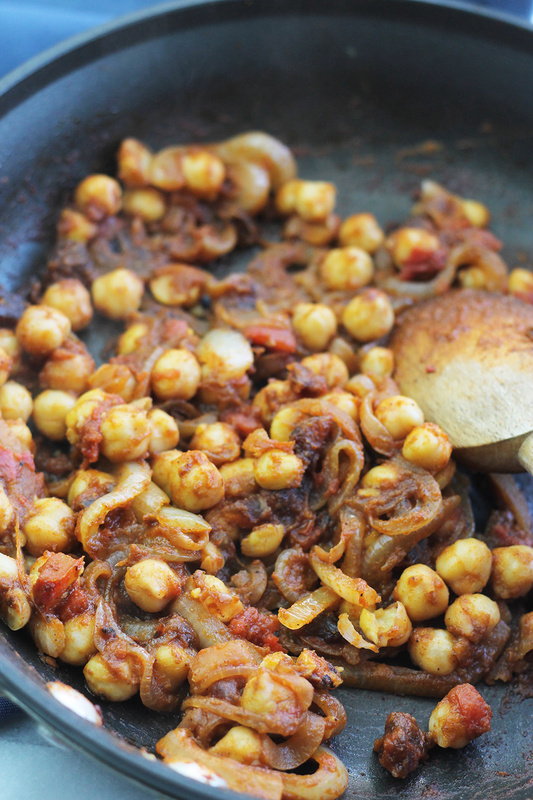 You dress up the chickpea with Moroccan spices very nicely. I love tartine with spinach with chard. I can’t get enough of chickpeas . Oh my goodness I have SO many cans and bags of chickpeas in my pantry too, for some reason I always manage to grab some with every grocery trip??? This sounds amazing, I cant wait to try, especially with that moroccan spice blend, so good! I absolutely love this recipe. It’s a veggie loaded dish that I’m definitely going to make very soon. Chickpeas are so nutritious and we all love it in my family. This will be perfect light lunch for my family.